Black Diamond Casino is an elegantly designed gambling destination that offers online casino players gaming excellence. Although it does not have as large of a game selection as other online casinos, it does provide generous bonuses, around-the-clock customer support, and diverse payment options to ensure a gratifying player experience. 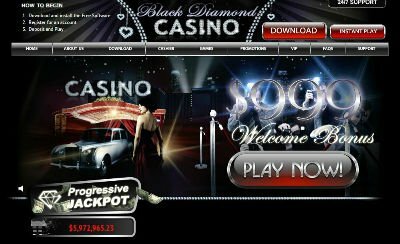 Black Diamond Casino is an eye-catching online gambling destination that promises players exciting online casino entertainment and a commitment to excellence. Although it isn’t revealed why the operators chose the name “Black Diamond”, what is known about this beautiful stone is it symbolizes strength, eternity, wisdom, and power, among other virtues. In fact, the special Black Orlov diamond was known for bestowing good fortune and happiness on anyone who touched it. That being said, potential symbolism association aside, this Black Diamond Casino review will reveal whether or not this online casino is more than just a fancy name with a flashy site design. Black Diamond Casino software is powered by TopGame Technology, a premium gaming software provider. TopGame offers games of superior quality that are equipped with incredible sound and topnotch design, but are also user-friendly and very secure. There are more than 80 games offered at Black Diamond online casino. Provided by TopGame, their selection of games include a range of spectacular Video Slots, Classic 3 Reel Slots, Single and Multi-hand Video Poker games, multiple Roulette games, and a variety of table games including Blackjack, Keno, Casino War, Mini Baccarat, and more. Players have the option to download and install the software for free or they can choose the Instant Play feature. This enables them to enjoy gambling entertainment download-free, directly from their web browser. However, at the time this review was written, a Black Diamond mobile casino was not available. New and existing players can take advantage of diverse Black Diamond Casino promotions. New players who sign up can receive a Welcome Bonus up to $999 on their first 4 deposits. There is also an All Games Welcome Bonus up to $300 available on a player’s first 3 deposits. On the other hand, new players interested in trying out the casino games, but who do not want to make a deposit, can sign up and enjoy the $25 Free Bonus, which awards them with money they can use to try out games in real mode without making a deposit. 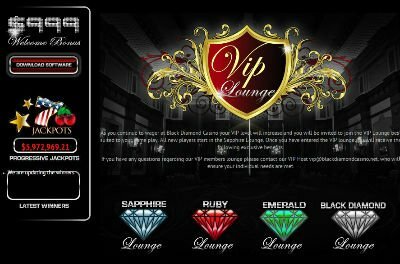 Existing players can benefit from daily offers, casino tournaments, or can become a Black Diamond VIP, which entitles them to regular bonuses and exclusive perks. Black Diamond payment methods include credit card and debit card (Visa, MasterCard, American Express), digital wallet (EasyDebit), ACH Bank Transfer (E-Check), wire transfer, (BankWire) and funds transfers (MoneyTransfers), Black Diamond Casino also started to recently work with Bitcoin (updated April 2017). Players in need of customer service can get in touch with the Black Diamond online casino support team via telephone, e-mail, or directly through live chat. Customer service is available 24 hours a day, 7 days a week. However, the one drawback is that this online casino caters to only English-speaking customers. The website and customer support is offered exclusively in English. 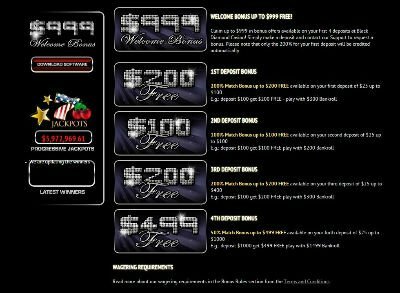 While it does not boast a huge casino games offering when compared to other online casinos, Black Diamond Casino is an elegantly designed gambling site that offers players the chance to enjoy a rewarding and fun casino experience, day or night. It’s definitely worth a visit.